However, it has now been forced to admit that the carbon footprints of Japan and Germany have reduced rather than grown, and to acknowledge that the price of electricity has been increasing for consumers in the United States, despite the “shale revolution”. Disappointingly, IPSO decided not to criticise the newspaper for the other inaccurate and misleading claims in Mr Moore’s article, including the erroneous assertion that the United States has reduced its emissions by more than any other major country. The UK, France and Italy all cut their annual emissions of carbon dioxide by a larger percentage between 2007 and 2017, according to figures published by BP and cited by the newspaper. Preliminary estimates of the output of energy-related carbon dioxide by the United States suggests it was 3.0 per cent higher in 2018 than in 2017. Mr Moore also wrongly alleged that climate and energy policies have left UK consumers “screwed”. In fact, research by the Committee on Climate Change has shown that green policies helped to reduce annual household dual fuel bills between 2008 and 2016. 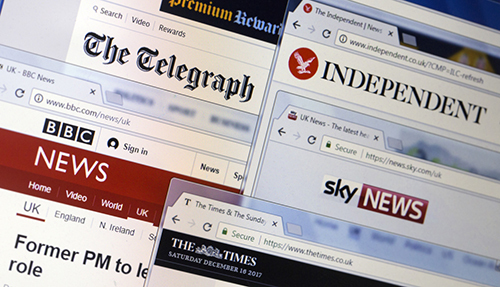 Surprisingly, IPSO did not rebuke the newspaper for failing to disclose to its readers that Mr Moore is a trustee of the Global Warming Policy Foundation, a campaign group set up by Lord Lawson to lobby against policies to reduce greenhouse gas emissions. The Foundation has previously been sanctioned by the Charity Commission for its promotion of climate change denial. In another blow to the credibility of the Foundation and its supporters, a new report made public this week has further debunked accusations of misconduct made by ‘The Mail on Sunday’ newspaper against the American authors of an academic paper published in the journal ‘Science’ in 2015. The article by David Rose, one of the Foundation’s chief cheerleaders in the British media, had claimed in February 2017 that the paper by Dr Tom Karl and his co-authors had been based on “misleading, ‘unverified’ data”, which had led to world leaders being “duped” over global warming. The newspaper article was disseminated widely by many lobby groups, including the Foundation, and was even cited by the former Republican chair of the House of Representatives Committee on Science, Space and Technology. However, IPSO subsequently upheld my complaint that the article was fake news, and the newspaper was obliged to publish a 647-word “adverse adjudication” in September 2017. This week, the report of an independent investigation into the academic paper concluded that it had “found no evidence that the Karl Study falsified, or intentionally distorted climate data”. The report explicitly cited the newspaper article as an example of the criticism that Dr Karl and his co-authors had received, but cleared the scientists of any serious wrongdoing, based on the results of a thorough investigation. Mr Rose has never apologised for his false allegations about Dr Karl and his co-authors. Instead he has recently returned, after a brief hiatus, to promoting climate change denial. On 30 December 2018, ‘The Mail on Sunday’ published a three-page article by Mr Rose under the headline: “Why all you’ve been told about these poor polar bears on the melting ice cap could be wrong”. The article acknowledged scientific evidence that the undeniable decline in Arctic sea ice extent recorded since 1979, which Mr Rose has previously attempted to cast doubt upon, is having an adverse impact on many polar bears. But most of the article was devoted to the views of Inuits in the Nunavut village of Arviat who had “turned a conventional wisdom on its head, saying that polar bears are not in crisis, nor even in decline: the main problem, according to the people who know them best, is that there are too many of them”. It is clear that Mr Rose’s employers do not believe his stories. The latest annual report by the Daily Mail and General Trust, which owns ‘The Mail on Sunday’, boasts of the company’s success last year in reducing its carbon footprint. Bob Ward is policy and communications director at the Grantham Research Institute on Climate Change and the Environment and the ESRC Centre for Climate Change Economics and Policy.